I've only ever used one razor, the Gillette Venus one with the soap bars. I can't remember what that's called but I'm sure you know what I mean. However, whenever I go on holiday, the heads ALWAYS SNAP! Therefore, for my recent trip abroad, I decided to pick up one of the new travel razors by Venus. I am very glad that I did. The razor works in the same way as the normal ones with soap bars, you simply wet the razor (or skin) and shave. 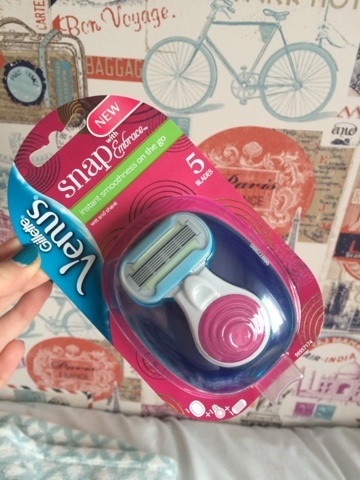 However, I found that this need far less water than the usual razors and I didn't cut myself once in fortnight I used it (a common occurrence for me) if glided just as well, if not better, than my usual razors and the pink spongy pad at the end made it easy to grip. Despite being shoved around in the luggage, the blue case it came in stayed perfectly intact and I think this would be great for any travelling at all, whether it's just in your handbag or in a suitcase on an aeroplane. The only issue I did have with it was that the blue soap parts only remained fully intact for 3 shaves. However, it still was easy to use and didn't irritate the skin for the other 11 times I used it, something which the usual Gillete Venus razors with the soap bars do.